Shares were already trading up 2.3% on the day (Tuesday) before the announcement, and advanced another 2.5% to $41.18 by 5 p.m. EDT. Revenue was up 0.8% to $1.15 billion, beating an expected 3.3% year-over-year drop for the third quarter, and an earnings-per-share of $0.52 beat Wall Street's $0.30 expectation. In fact, income from operations have fallen year over year for the fifth straight quarter, and for nine of the last eleven quarters since Chief Executive Officer Marissa Mayer stepped in to help start a much-needed turnaround. Income from operations fell to $42.2 million, or 54.5% from 2013's third quarter. And as expected, the bulk of YHOO's earnings came from its investments overseas, which have for some time been propping up a beleaguered core business. YHOO holds a 35% stake in Yahoo! Japan, and a 15% stake in the Chinese e-commerce giant Alibaba Group Holding Ltd. (NYSE: BABA), which provided pretty much all of YHOO's income on the quarter. After the Alibaba IPO last month, as a part of a long-term repurchasing agreement where YHOO has plans to shed its BABA share, YHOO trimmed its stake from above 20% to the now 15% stake. And that sale explains the massively overinflated 2,183.5% growth in income. The BABA shares fetched YHOO $9.4 billion in pre-tax proceeds – $6.3 billion after tax. 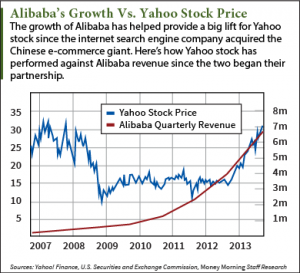 The optimistic earnings season highlights a new conundrum for YHOO and its shareholders.